Jenae graduated from the Veterinary Technician program at Madison College in 2012. 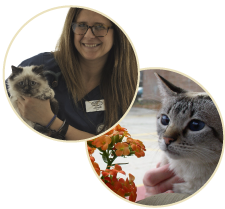 She began working at Veterinary Emergency Service and shortly after began at Whole Pet. She has been with both clinics ever since. At VES she works as a Critical Care Technician and as Middleton’s ER hospital coordinator. She loves the technical skills aspect of Critical Care, the client education aspect of General Practice and enjoys anesthesia in both critical and stable patients. Jenae just purchased a home (Spring 2018) outside of McFarland and will share it with her husband Shea, Terrier Mix Pilate and 3 cats Kitty, Blarney (tripod) and Ripley. Jenae enjoys any outdoor activity. She has gotten injured too many times skateboarding, but insists on continuing it as long as possible.